In recent years in Australia, much like the rest of the world, self defence has become more important than it had been in the past. With both assaults and the use of bladed weapons in Melbourne increasing dramatically, many people have turned their attention towards taking responsibility for their own self protection. While most martial arts tend to specialise we are lucky to have a full range of Self Defence techniques in our style. Joint locks and controls are common in most techniques (any joint on the body can be locked). Striking is done with all parts of the body such as hands, elbows, head, knees, kicking etc. These are usually done while at the same time applying Pressure Points and Nerve Strikes to slow the attacker down. 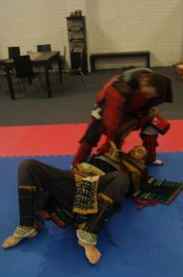 Virtually all of our training is done in pairs, for example, a typical drill is you opponent grabs your shirt with their right hand and punches to your head with their left hand, and we practice a defences against this situation. However Martial Arts is not just about your body, it's also about your mind. The Bujinkan training methods offer many opportunities for you to improve your spirit; strategic thinking is the foundation of our martial art training.